Now you've studied for your exams, you pass the RAE test and you apply for your callsign and you are given the AROC - Amateur Radio Operating Certificate (not Alfa Romeo Owners' Club) with a Class B license. 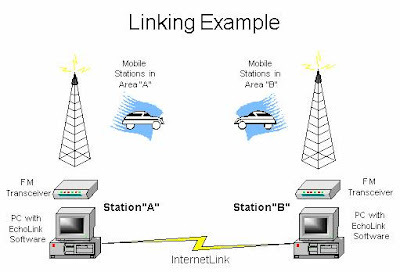 You admire in the Class A license because they have the permission to transmit in HF (high frequency) whereby Class B AROC only allows you to transmit on VHF (very high frequency) and UHF (ultra high frequency). So you think, how am I supposed to talk to people from the other side of the world. HF can do that because the wavelengths are longer and it uses the ionosphere for propagation thus making it travel in great distances..lets say up to Japan, Australia etc. So here you are stuck in DX (transmit and receive) in VHF & UHF. Well not anymore. Fancy in chatting with some from UK? How about asking someone in Venezuela whats the weather like? Another one of the great things about Amateur Radio is that, it is a Hobby for experimenters. Like 9M2RT said the other day in the class, any form of telecommunication before its being put out to the public, is tested in Amateur Radio Frequencies, and so was Voice Over IP or VoIP technology. It was the Amateur Radio community that tried and tested VoIP when internet was started. It was a way of changing analogue signals to Digital data packets thru IP and convert it back to analogue. This way you can lets say be hanging out in MSI having TT with club members, and using your handy talkie QSO with someone in USA for instance. Way cool ain't it? This way, Class B license holders not only can communicate in country, but out of country using low power stations via means of VoIP. In HF, you may need a lot of power to be able to TX (transmit) and be heard at some other parts of the world and that is following the propagation of the sun solar flares, conditions of the wind and clouds etc. With Echolink, you take all those things away. I have personally heard someone in his car in Ipoh QSO with someone on the M5 Motorway in UK and another time someone from Venezuela QSO with someone somewhere in United Kingdom, Unbelievable!! This Echolink software is FOC BUT you need to build a small box that will let you connect your rig to the computer to have the signals changed. This box is easy to make and those guys in Ali Baba can show you how because they have built a few from scratch. Now suddenly Amateur Radio sounds interesting to them computer geeks out there huh? If you are interested to find out more about Echolink and how to get the software, visit www.echolink.org or www.eqso.net.